Well, no not really. HAHAHAHA. I love Rick Riordan’s sense of humor in his books, and The House of Hades is no exception. There are plenty of serious moments, but the light-hearted moments make it so much more entertaining. In the previous book, The Mark of Athena, we are left with Percy and Annabeth plunging into the depths of Tartarus. They must reach the doors of Death from Hades’ side, while others meet them on the other side of the doors. Together, the doors must be closed to prevent Gaea’s minions from raising her and ruling the earth. Bob the Titan is back and Percy and Annabeth would not have survived Tartarus if not for him. 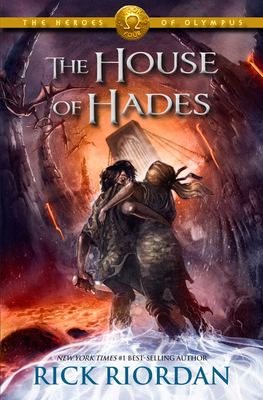 While Percy and Annabeth face their own challenges head-on in the Underworld, the other demigods must each face their own…and they do so amazingly. Each one grows, some of them you can literally see physical changes. Frank undergoes a tremendous growth spurt, both in stature and as a leader. It was nice to see him step it up. I also especially liked that Leo had some time with Calypso; it would be nice to see them back together. And Nico’s surprising revelation was totally unexpected; did not see that one coming! The subject matter was handled very well by Riordan. I cannot wait for the next, and final installment of the Heroes of Olympus. Here’s hoping that Riordan continues with Percy and the group in another series. This entry was posted in Children and tagged heroes of olypmus, percy jackson, rick riordan, the house of hades.